Imagine the perfect place for living and running a business. Imagine friendly society where you feel safe and secured. Imagine open space and attractive amusements. And, finally, envision all this moving all around the world continually. All this lies in the conception of the Freedom Ship, a project not only for building the biggest ship in the world, but for creating a unique mobile community. The Freedom ship will be ''city at sea'' – it will provide cosmopolitan, international, residential, full-spectrum, resort city which will travel the world once every 3 years. There will be opportunities for daily living, traveling and even owning a business. The ideal place for living would be on the biggest ship in the world. The initial proposal for this amazing project came in the late 90s by Norman Nixon. Unique environment where the modern city and the finest resort are combining their amenities. 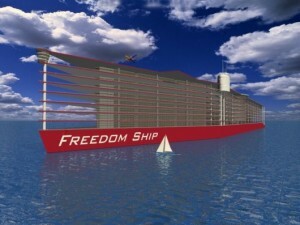 Freedom ship would be luxurious and modern city, which would provide safety and mobility in one. As from a legal point, the biggest ship would be subject to the laws of the country whose flag she flies and also to the international maritime law. Freedom ship would follow a cruise ship rules and regulations. The design sizes of the biggest ship in the world in project are length of 4,500 feet, height of 350 feet and width of 750 feet. 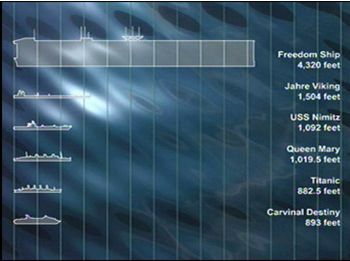 The longest ship in the world currently, Seawise Giant, would be nearly 3 times smaller and Queen Mary would be 4 times smaller than the Freedom Ship. On the ship's top deck there would be an airport. It is designed to accommodate small commercial or private aircraft. This superstructure would include a first-class hospital, schools, restaurants, casinos, a library, residential space, entertainment facilities, wholesale shops, hotels, offices, banks, light manufacturing and assembly enterprises, warehouses, recreational and athletic facilities. 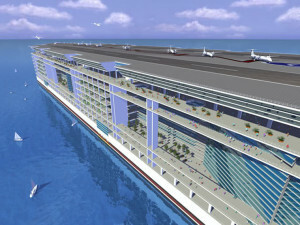 The Freedom ship would be ''Community on the Sea'', a world-class resort. The Freedom ship would be very attractive. The design plans more than 200 acres for relaxation and recreation in open areas. 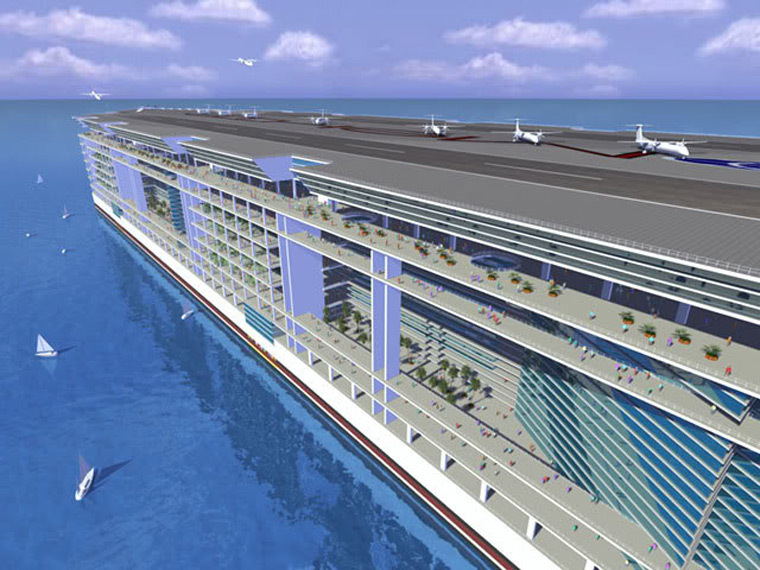 The onboard promenades and parks would be green with ponds and even waterfalls. Large aquariums with saltwater will be seen at most levels. The shopping mall will astonish with its sizes and beauty. The marina at the stern would be reached by a main deck wide 100 feet. 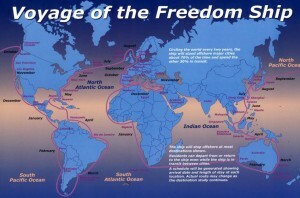 In the Freedom Ship design plan lies the conception for portions especially dedicated to different countries. The architecture plan will feature their cultural characteristics. The bottom hull would be flat. The combination flat hull and enormous size would give unseen stability. The Freedom ship would sail smoothly even the roughest waters. To enhance the safety additional 600 air/water tight hull units would be used. The fire safety would be secured by 4 hour rated firebreaks. 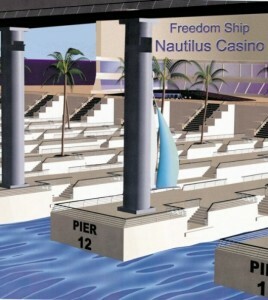 They would be placed within the decks and between the decks areas. The fresh, filtered air supply would be done by an electro-static ventilation system. 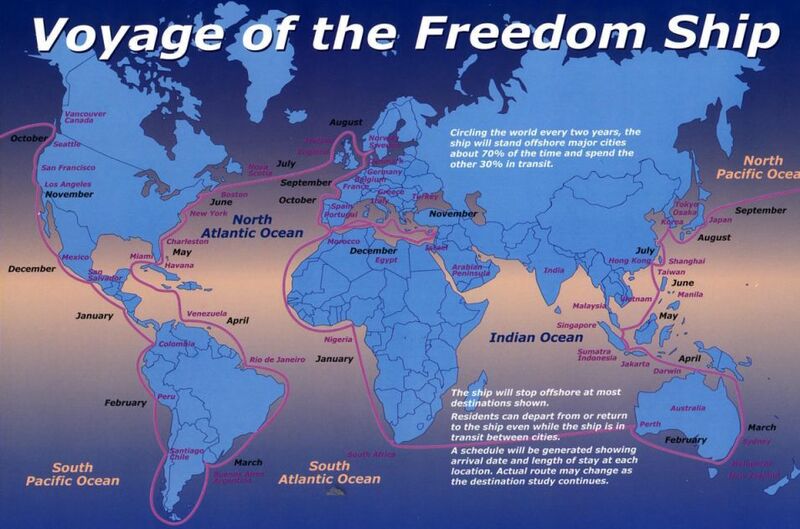 During her world voyage Freedom ship would go to tropical, reachable only by sea, exotic islands. This would expand the business and touring opportunities, also would bring more visitors to the biggest ship in the world and would promote her entertainment facilities, shops and restaurants. The Freedom ship would be capable to accommodate full time up to 40,000 residents and 20,000 crew members. The daily visitors might be up to 30,000 and the nightly guests in the hotels - 10,000. This makes a population of nearly 100,000 people, a good opportunity for starting a private business onboard and nearly 40,000 tourists for the visited ports. The latest cost estimation of building the biggest ship of dream are for $11 billion dollars. 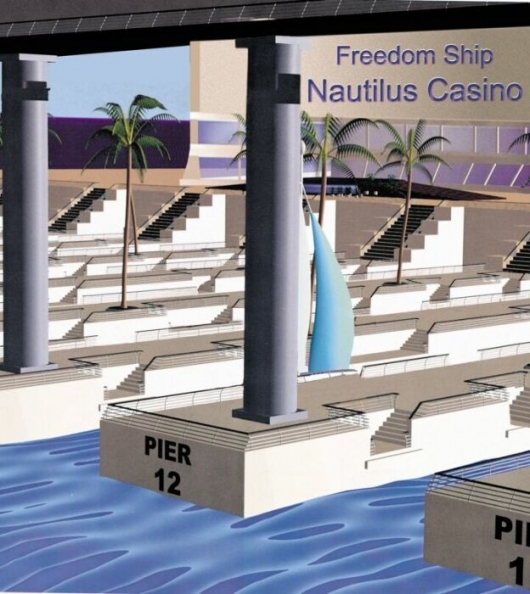 Freedom Ship International are not planning ship property pre-selling in order to raise funds for building. The selling will begin after the City at Sea is financed. The price for a suit will vary in the range $150,000 - $7 million dollars. To design and build the astonishing Freedom ship project is not only typical marine engineering task. Currently, no shipyard can offer to construct and built this huge sized vessel.